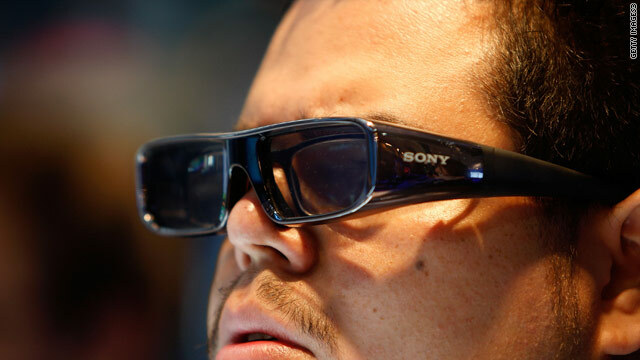 A gamer uses 3-D glasses for a Sony Playstation demo at a video gaming conference in California. (CNN) -- From "Mario Kart" to "Mortal Kombat," last week's Electronic Entertainment Expo made one thing abundantly clear: 3-D gaming is just around the corner. But despite what the game console makers Nintendo and Sony might suggest, gamers may not be ready for another dimension to invade their lives. Thanks to the well-timed arrival of 3-D-ready TV sets and video game systems, though, players may soon have no choice but to welcome the in-your-face medium. Heroes and adventures will be designed to pop from your television screen. There will be no escaping it. Nintendo's handheld 3DS system, for example, will showcase 3-D graphics on a small screen -- without requiring users to wear clunky 3-D glasses. The dual-screened handheld makes the strongest case for the concept yet, thanks to its convenient, affordable (at least, compared to current living room setups) and simple, no-glasses approach to three-dimensional play. It's impressive that the Nintendo 3DS is able to offer genuine 3-D special effects on a 3.5-inch display, which isn't bigger than many smartphones. Meanwhile, the handheld system, which does not have a scheduled release date or listed price, does have a compelling list of game titles, including "Animal Crossing," "Paper Mario," "Contra" and "Final Fantasy." Familiar Nintendo staples will also reappear on the new system. They include "Kid Icarus: Uprising" and "The Legend of Zelda: Ocarina of Time 3-D."
Enhanced versions of popular franchises like "DJ Hero 3-D" and "Nintendogs" are also in the works. The three-dimensional games are restricted to Nintendo's handheld device, however. Sony's PlayStation 3 is the first set-top box to receive a software update that allows 3-D games. And graphics on the system burst from the TV screen like pop-up-book cutouts. The first PlayStation 3 games in 3-D were released on June 10. They include the crash test dummy simulator "PAIN," a futuristic racing game called "WipEout HD" and a modern-day "Asteroids" clone named "Super Stardust HD." A demo of arcade speedster "MotorStorm: Pacific Rift" is offered as well. Future 3-D titles such as sci-fi shooter "Killzone 3," "Crysis 2" and driving simulator "Gran Turismo 5" are also planned. One drawback: All of these PlayStation games require you to have 3-D TV and a set of those stereoscopic, 3-D glasses in order to enjoy the third dimension. 3-D graphics will be coming to two other major gaming systems -- the Nintendo Wii and Microsoft's Xbox 360 -- via two games: "Batman: Arkham Asylum" and "Attack of the Movies 3-D." Both of those systems require users to wear low-tech, red-and-blue 3-D glasses, which break from the industry standard. You won't see 3-D images like those in movie theaters today on the Wii or Xbox yet. Finally, gamers can also turn to their personal computers for 3-D action. Graphics maker NVIDIA already offers a solution for playing over 400 games such as "Battlefield: Bad Company 2" and "Resident Evil 5" in 3-D on your PC through its 3-D Vision platform. To do so, you have to own a 3-D video card, monitor and active-shutter glasses. All of these hurdles -- combined with the price burden of getting all of this new equipment -- means 3-D games will have only a small audience for now. Plus, no one is really clamoring for these upgrades. There isn't an outcry among gamers that two-dimensional games are broken, for example. Console makers still have some work to do before the masses will make the switch to three-dimensional gaming.